FOUR years ago we started our free membership site! Our goals were simple. 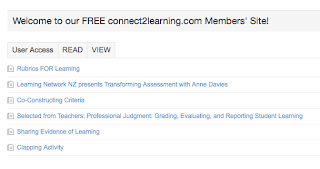 We wanted to support educators to understand the power of assessment for learning to support ALL students. We wanted to make it more possible for more people to learn about these ideas no matter where they lived. 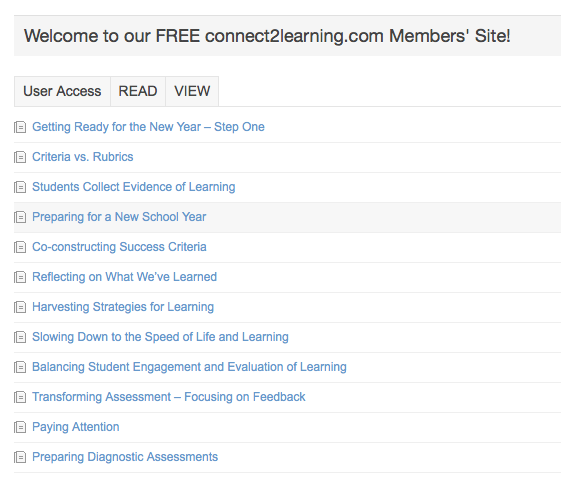 There is a collection of resources for you to access and enjoy. Many of these are available because of the many educators who have learned along side us over the years and welcomed us into their schools and classrooms. Here we are! Four years later we’ve gone from a few members the first few months to now having more than 5900 people accessing these resources regularly. While most members are from Canada, we also have members from around the world. Joining is easy! Just choose a user name and password. 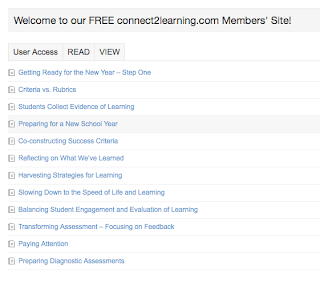 We've reorganized the content around postings to READ and postings to VIEW. We will be adding postings to LISTEN and to DO in the upcoming months. We usually add regularly but with our new revamped members site we will be making additions monthly. We have changed this structure to deliberately mimic our site for University graduate and undergraduate students (and professors). We get lots of requests from people for permission to share the materials in other forms and for other audiences. We also see lots of sharing of links from individuals to their entire networks. We love seeing the spread of the blog views via twitter and the e-newsletter move from country to country around the globe. We are pleased to be able to continue this service for one more year. This free service was made possible because people volunteered their time and expertise and Building Connections Publishing gave a percentage of their profits to support this work. One unintended consequence of sharing free resources is some people see to think that all the resources should be shared freely. We wish that was possible. One day perhaps it will be if an organization chooses to fund this important work. In the meantime, it is the paid resources that fund the free resources. If the paid resources are pirated, used without permission, plagiarized, or passwords shared beyond the purchaser, even with great enthusiasm for sharing the work, the result can be fewer resources to fund the free members site. 1. You can help us by sharing links to the free materials and letting people know where they can go and sign up for themselves. 2. You can contribute by commenting on the blogs, sharing your ideas, and sending in your questions. 3. Lastly, you can contribute by purchasing resources that you need that are not on the member’s site and by using them according to copyright and legal permissions. In the coming months we look forward to an even more fabulous FIFTH year of support. We have plans to share more practical ideas, more video clips, more research, and more responses to emerging questions. We are also excited as we put together the final details in preparation for the launch a brand new membership site designed for universities - graduate and undergraduate courses - so that pre-service and graduate students can have access to the latest information and ideas. We look forward to continuing this amazing conversation. Please keep in touch! 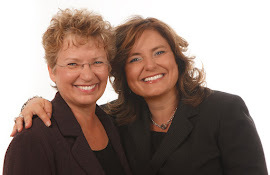 Sandra Herbst, Executive Director for Connections Group, is a noted system leader, author, speaker, coach, consultant, and educator with extensive experience in assessment, leadership, and adult learning. Sandra’s expertise, informed by wide-ranging practice and research, is enhanced by her compassion and humour. She has worked in both elementary and secondary schools as a classroom and specialty teacher, school administrator, and program consultant. Sandra is the former assistant superintendent of the second-largest school district in Manitoba and a past President of the Manitoba Association of School Superintendents and the Manitoba ASCD Affiliate. As Sandra works with schools, systems, and organizations, whether in person or online, she tailors her work to meet the learners’ needs. She is a charismatic and highly energetic speaker and leader who is deeply committed to seeing the educational system contribute to the success of all learners. Five Steps to the BEST SCHOOL YEAR EVER! The Better Choice? On line Grading Programs or ? ?